Question: Should I water the hanging plant? 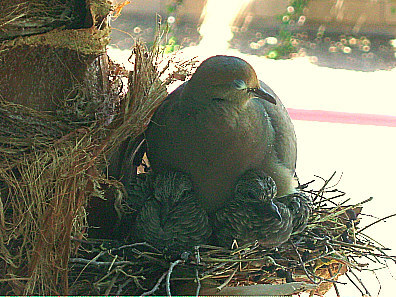 Mourning Doves nested in a hanging plant that hangs a couple of feet from the window in our den. We literally walk about 1 foot from the plant when we come up the steps to enter the house. 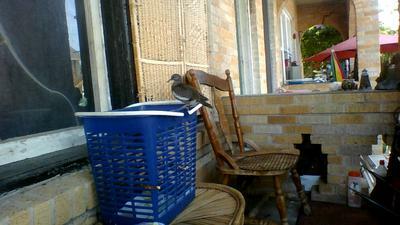 During the first week the dove would fly away when we went out or came in, now it doesn't even move when we walk by. The babies should be hatching any day now - it's almost been two weeks. We haven't watered the plant and it is seriously dropping, but I worry about protection for the birds. Do they need the foliage? Should I water to revive the plant? The babies have arrived! At first we couldn't see them because they stayed under the parent all the time. Then we started to see 2 mounds of eathers underneath mom/dad. Today, they are sitting out on their own. Here are some pics. 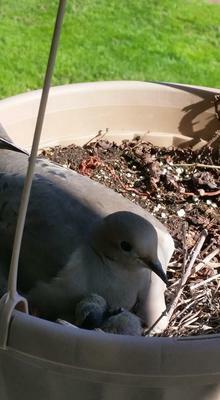 Our dove hatched yesterday morning and now there is not a parent with the baby. She was there this morning but hasn't been seen all day long. What can we do? Notice how she made her nest in the hanging basket. Several weeks ago, my family and I were in our backyard grilling some hamburgers, when a bird suddenly flew out from under the porch. 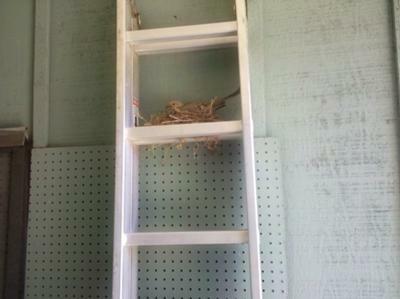 We had no idea that a nest had been built…on the top wrung of our ladder. 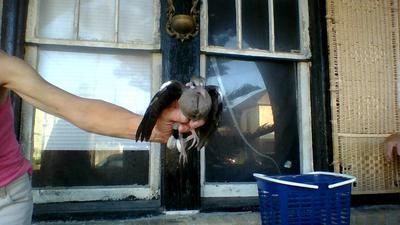 It’s leaning up against a wall by our porch and now it’s home to a family of doves. Try explaining that to your neighbor when he calls to borrow your ladder. Whenever I let my dog out in the morning, I would go out and wish a “good morning” to the mama dove and she would stare blankly back at me. There was some discussion in the beginning as to whether or not she was even real, since she sits pretty much motionless. 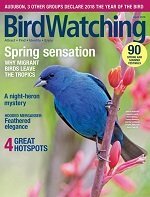 We now know, thanks to this website, that its not just the mama bird that sits on the nest, but the daddy bird as well. Which is kind of cool. The parallel was not lost on my husband. I would sit at my kitchen table doing some work, watching the mama bird sit there motionless. Talk about patience. She’s definitely in line for “Mother of the Year”. Finally, after two long weeks, there appeared two large baby birds. It was kind of humorous seeing them all, mama and babies, crammed into that nest. After a few days, the baby birds moved out of the nest and into the shrubs. It took them a couple of days to get the hang of flying and not smacking into my windows upon takeoff, but eventually they were pros at being birds and I’m sure they are happy in a tree somewhere not far from my house. This was a really fun experience to watch and I love all the great things my kids and I have learned from the Dove Family. 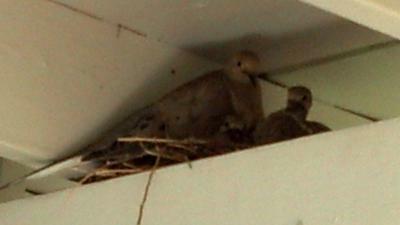 I think the Dove Family has adopted us too, because they’re raising more baby birds…on the top wrung of our ladder. I think it’s time we invested in a nesting shelf. I work in an office building in Mesa, AZ. It is a new building that was built a little over 2 years ago. There are palm trees along the outside of the building some reaching up to 50 feet high. Tree trimmers will come and trim the trees which leaves short pieces of trimmed palm stalks. I have a window in my office that looks out to the parking lot. There are about 2 palm trees right outside. One day I was sitting at my desk and noticed some birds outside my window. I looked and two mourning doves were sitting on one of the trimmed trunks right outside my window. The windows of our office building are tinted and have a mirror like reflection, so I can look right out my blinds at them and they don't see me at all. I'm glad I didn't scare them away. They must have built a nest and laid eggs. It didn't look like a nest just a few twigs stuck into the tree trunk. I came into the office on Monday morning and noticed wings flapping outside my window. There was momma bird feeding two rather large baby birds. I was so surprised that I took pictures and sent them too all the people in my office building. People are always stopping by to see the momma and babies. I Sure hope the babies are strong flappers. 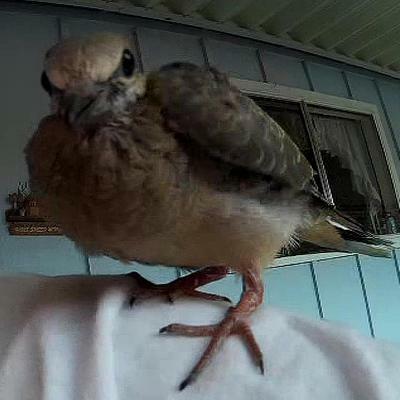 They have been stretching their wings, and it seems like momma leaves for longer periods of time during the day. The sidewalk and parking lot are right below their nest. I really hope that they decide to start flying on the weekend when none of the cars are around. 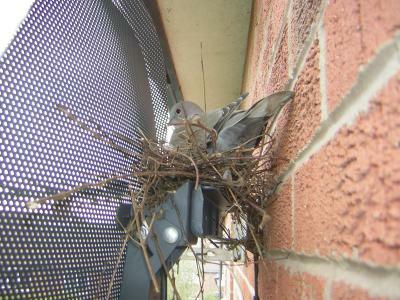 First time I noticed a pair of doves nesting is when the picture on the tv was going on and off. I went upstairs looked out of the bedroom window, and noticed a dove passing twigs to its partner as one of them was building a nest on back of my satellite dish. They were building the nest for a couple of days and I noticed fallen twigs on the path below the dish. One day as I looked out of the window to see how they were getting on I noticed the doves were no longer there. It looked as if they had left a half built nest. Thinking to myself they must have gone elsewhere. A few hours later the picture on the tv went off again, so I went out of the back door looked up and our featherd friends had retured and roosting on the nest. Daily me and the wife open the window to see how they are getting on and not once do they look alarmed at our presence in doing so. My wife has named them Boris & Doris and with all the satellite dishes all around us we are honoured they have choosen ours to nest. 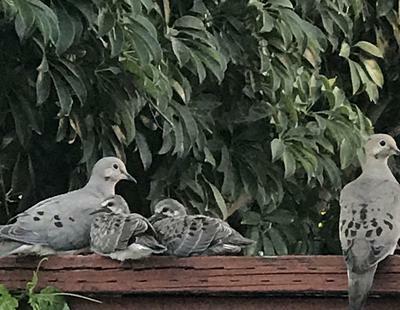 Took a better picture of my satellite doves who are still nesting, On reading about the birds its Boris nesting during the day and Doris takes over later in the evening. The food we have been putting out has been taken by them as well with other birds, just hope the chicks stay on the nest when they hatch being such a small nest, fingers crossed. Like most things in life baby's are born, they grow up, then they leave and thats what happend to Boris & Doris young. Over the weeks we watched the eggs hatch and slowly they grew bigger and bigger so much so Boris & Doris couldn't roost on the nest with them. Then my wife noticed the baby doves "By the way, the wife called them Rosie and Jim" on the front of the dish and then they took there first flight and left, "a sad moment" and we didn't see them for a while until we saw fluttering in the tree in our garden and it was mum & dad feeding the baby's, it was a relief that they were ok. I hope they will nest again on the dish it was a pleasure watching them progress. 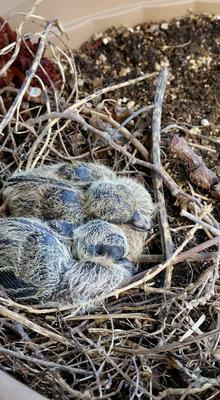 A few weeks ago I found a baby mourning dove by my home. It was a tiny little thing blown from its nest I assume. The seagulls and Boat-Tailed Grackles were just about to swarm it so I took it in. 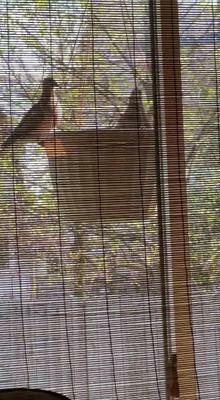 I made a cage for it and began feeding it bird seed and water. It has grown fast and is doing quite well. Funny part is, as it began to learn to fly it follows me! Even when I ride my bike it tries to follow me. He can now fly on his own but returns to my porch since I sometimes leave seed out for it. Very sweet little bird too! Hope it makes it and survives. After bonding with humans they do not do well on there own, you have a friend for life. We love our visiting doves. This has been going on annually since we moved in 2012. This is a three generation picture taken this 2014 season. Each year they build a new flimsy nest in the same place. I think global warming is delaying their return. I'll have to take better notes next year. All of a sudden, a little tail or two will be hanging above the nest. Then, they'll leave the nest to learn to fly. Momma and Pappa tend to all fly off together beginning with ground lessons. Once they leave the nest, they don't return until next year. Just As last year, the little ones appear to be learning what the ground feels like, air surrounding them now that they're not protected by the walls of the nest or their parent's body. They may be there for a couple of hours or more. I attached another picture of them finding protection of the rocks we just had delivered in our yard. My four year old granddaughter and I made a fairy garden in a pot on my deck. It is on a stand that is approximately four feet tall. It consists of soil and twigs for a fairy home covered in moss. She sprinkled small pebbles and gravel in the pot as well. 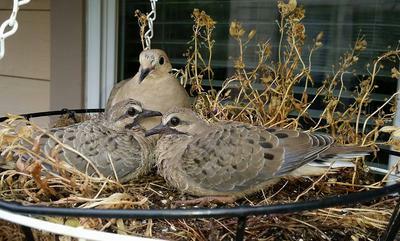 The doves made a very sparse nest of small twigs and laid their eggs. They have been incubating for about two weeks now. This is right in front of a window in our great room so we have been able to watch the entire process. They do not scare when we barbecue on the deck or use that exit. We act as if they are not there when in our small backyard and deck. They do not seem disturbed. This has been a wonderful learning experience for all. My granddaughter peeks out the window every morning to check on the doves. She is particularly happy that they used her fairy garden as their nesting area. The adults, my elderly mother and my friends can't believe that they have continued to nest there. This has brought my mother happiness in her last years. It's as if these doves have become part of our extended family. We are anxious to observe this whole process. 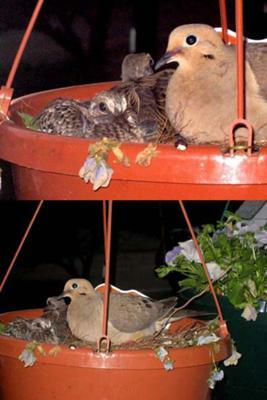 Doves in hanging basket, now parents! 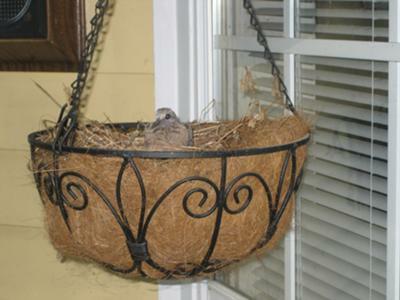 I was about to take down my old hanging baskets from last year when I noticed a dove sitting in it. Not long after there were 2 eggs. Then came 2 chicks. Very interesting to watch. Waiting to see what happens next! Hope the babies make it. We live right in town so I hope they do. I have a visitor. 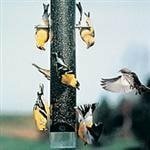 About a week or ten days ago as I walked to my kitchen window out of the corner of my eye I would notice a grey bird fly off from perhaps the window sill. I figured that there might be a nest nearby. Well sure enough there it was, not more than six feet from the window and I would guess about 20' off the ground. The mourning dove does not seem to be frightened. 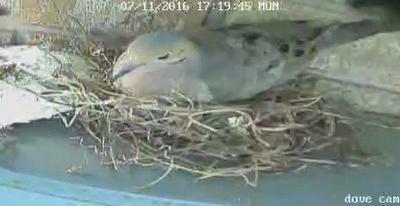 For about 2 to 4 days the dove seemed to stay in the nest and to be honest seemed a little fatigued. 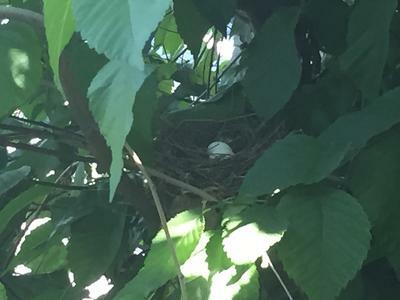 Well yesterday I noticed 2 white eggs in the nest and the dove was gone. I'm sure that she needed to eat. Now she seems to be spending all of her time on the eggs. I am taking a dozen or so pictures every day and am excited to watch the goings on. You may be missing when the adults switch places. Just wanted to share my photo I just took today. 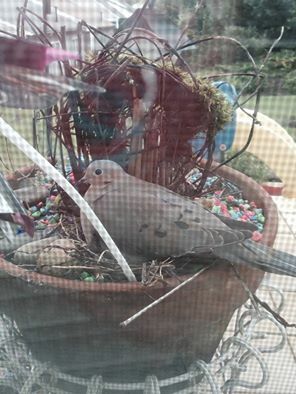 Surprised to see a dove sitting in my front porch hanging planter. My door front door is only about 7 feet from the planter so I hope we do not scare it off. Comments for Hanging Pot Nester? 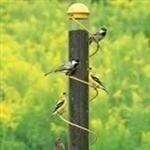 It is such a pleasure for me to find our bird friends making use of our home decorations. Good for you. I too worry that my presence will pose a threat. I just try to be unobtrusive, yet enjoying nature along with my friends. A couple weeks ago I was working in the garage and I heard a commotion on the sidewalk. I walked out to find a baby bird being pecked at by what I thought was a Pigeon. It looked like it had probably fallen out of a 30 foot Palm tree. expecting it to be dead because of the intense pecking of the adult bird, I walked up to it expecting to dispose of it. To my surprise, it was alive and didn't seem to have any wounds. Totally expecting it to die during the night, I put it under a cardboard box at the side of the house. First thing the next morning I went out to once again dispose of it and it was very much alive. Perplexed as to how to feed it I tried several things, but never did decide on what was right. 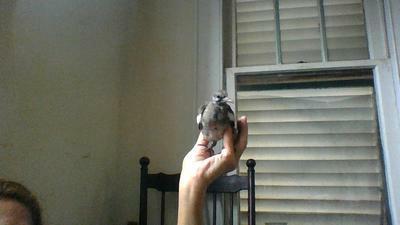 He was old enough that I thought if I could somehow keep it alive for a few days, it might get old enough to eat seed. I finally settled on mixing bottled water with sugar and dipping a drinking straw into the water and forcing his beak into the end of the straw. For several days this was the only nourishment I could figure to give it. 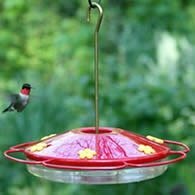 Sugar water works for Humming Birds, so maybe it will work. I finally located some baby bird food at Petsmart, but after getting it home and reading the directions, I returned it because according to the directions, Walter (initially thought he was a pigeon) was big enough to eat seed. Way to late to make this a short story, but two weeks later and Walter is thriving. I put him in a cage that was originally for my daughters puppy. and put some river rock and a lot of seed on the floor to get him used to foraging among the rocks for food. Two days ago I opened the cage door to let him experience nature and he flew off for the cover of a Texas sage bush in the back yard. After a little while I went looking for him and he was still under the bush. I put my hand down and he climbed on. I put him back in the cage. Same thing the next day. This morning I opened the cage door and he took off for the tree next door. Totally expecting him to take off for good, I went out to clean the cage a couple hours later and there was Walter on top of the cage. Well, tonight Walter is in his cage, again, and tomorrow will continue with what I have been doing. He is a very sweet little guy. 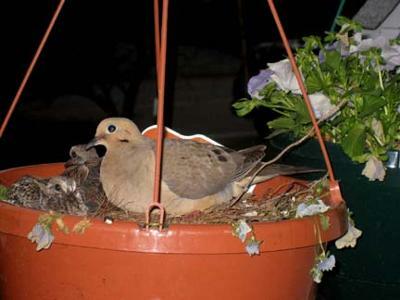 I noticed two doves in one of our hanging flower baskets one day. 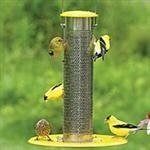 I love birds so this excited me! Some time went on and I didn't think much of it (and I didn't see the birds again). My husband and I went on a trip and when we came home our house-sitter told us there was a bird in our basket outside of our bedroom window. I did some research and learned about their nesting process and realized she/he must have some eggs in there. Our dogs were oblivious, thankfully. And before we knew it there were two chicks in the nest. I watched them from afar and was so excited. I took this picture one day before a walk and when we came home they were gone. 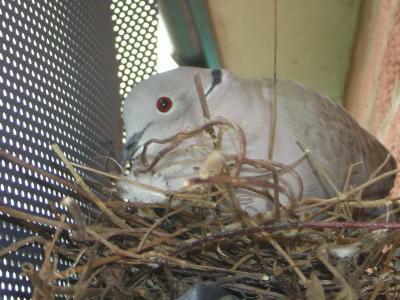 One morning, we woke up to cooing outside our bedroom window and when we went outside we saw two doves working on nest building on an electrical conduit. A few days later there was only one, sitting on the new nest. It happened to be right next to one of our security cameras, so we turned the camera in that direction. 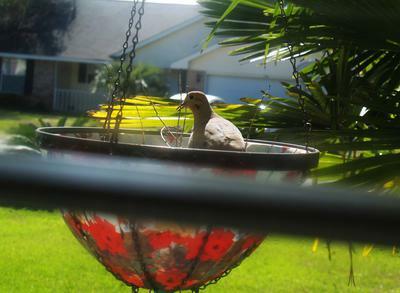 We got worried that "momma dove" was going to starve to death, so we bought some dove seed and put a water bowl near the nest. Then we discovered that our worries were needless, having read your description of their mating habits. Our video confirmed what you reported. The male dove steps off the nest in the morning. There is one egg. The female takes responsibility for the day shift. Apparently, however, we cannot upload video. So here is one still. We hope to have more footage if there are any babies and we will share them with you. Two questions. It appears that there were several hours with nobody on the nest at night. Because they are still "guarding the fort" is it safe to assume the egg is still viable? 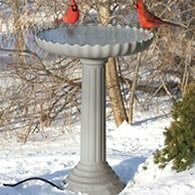 The second question is why don't they use the readily available feeder which is about two feet down the conduit from them, but out of camera range? We'll keep you posted. P.S. Can we upload this or other video? What video is too large? what resolution is preferable? Dove Not Nesting in Winter. 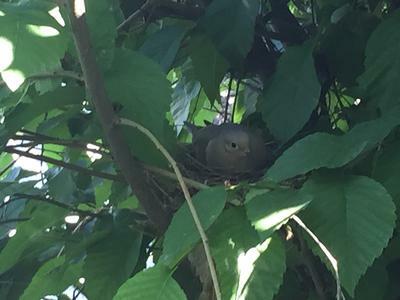 This past summer I noticed a pair of doves that nested in my cherry tree. The nest was loosely made with minimal twigs. They had two babies which grow extremely fast. Shortly after they had another pair of babies. OK, while sitting on my back porch at night I noticed one dove sitting on a branch in the cherry. Every night this same dove sits in my cherry tree, no nest, just sitting all night, then flies away in the morning. It's been over a week, getting cold out (live in n.e.) is this normal not to build a nest for the winter. Puzzling! Comments for Dove Not Nesting in Winter. Our wintering birds do not build nest for winter. 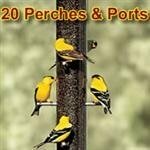 Usually, open nesting bird types, like doves, will roost in evergreens or thick brush during the night. 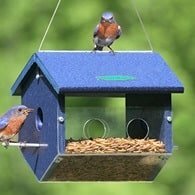 Cavity nesting birds such as Bluebirds or Woodpeckers will use holes in trees and sometimes birdhouses for roosting. Nest are for raising young. What a great surprise I found when watering my hanging plant. 2 little eggs. Husband and I thoroughly enjoyed watching from the beginning until the nest was empty and the babies were in the yard with Mom. 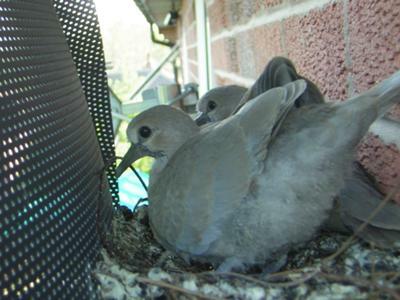 For many years we have had Mourning Doves nest in the hidden eaves above our front door. We witness the male offer twigs to his mate, but she is very picky and the rejects are flung down below at our welcome mat. I can see their nest when I climb the indoor stairs, usually one eye is visible too. 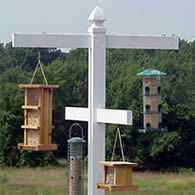 This area is safe from predators as the eave is protected and cannot be seen from surrounding trees or roofs. A predictor would have to fly straight up and backward sort of to reach the nests. Our MDs know how to maneuver this tight space. It is messy for us but that's ok. This April, we had some me construction work done inside our home, so I placed a sign on a he front door to be careful of our nesting birds. 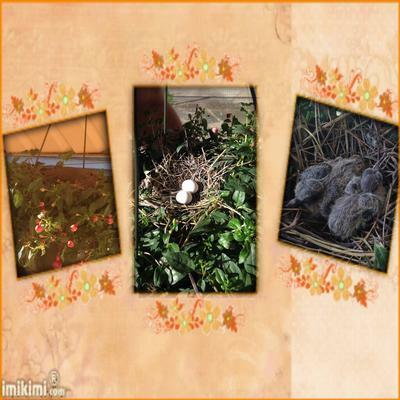 When I came home the nest was scattered on the ground along with two broken eggs! I was so mad. The contractors are gone now and I saw the the pair had brought their family over to our backyard to visit us. They were not concerned that we went out to harvest some fresh herbs from the garden underneath this fence. I hope they come back to nest again next year. ?! Where are the previous residents; and what have you done with the children?! Coming to and from my house I was met with quite a surprise on my front porch; a mud nest. The nest was literally not there one day, there the next. With a little research I discovered this was a swallow's nest; verified by a sighting soon after. 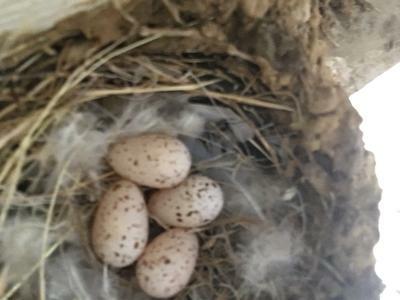 I was able to peek in the nest and discovered four eggs. A week or so later I came home to find three of the eggs broken/missing and only one remaining in the nest. The couple had departed as well. So very sad. About a month or so later; out of curiosity I happened to look in the nest though there had been no signs of the couple. I was shocked to discover four more eggs! 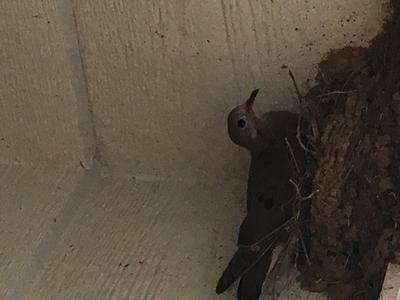 Mom and dad never made an appearance but about a week later as I was leaving the house I was met with a dove atop the nest! She looked at me, I looked at her; I found her to be quite bold considering the circumstances. She provided no explanation as to why/when she moved in and most importantly, what became of the former residents (I say she as it became apparent with some time and research that the "calm" one was the female). I noticed she was sitting rather high on the nest; the couple had installed new flooring so to speak. A nice layer of twigs. I'm quite perplexed at this point and come home to find the nest unoccupied giving me the opportunity to take a peek. 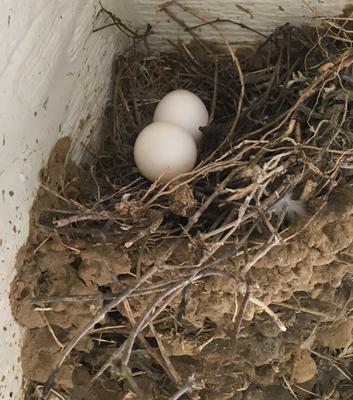 Two dove eggs! The nesting material is deep and though I can't see under this newly installed layer, I suspect the swallows' eggs are under this layer; bit of an egg sandwich so to speak. At this point we're getting to know each other. Dad has a more sensitive startle response; which lead to my own startle response, and ultimately to a sprained pinkie (that's another story but lucky for him, I don't carry a grudge). I've been coming and going via the back door as much as I can in an effort to support a peaceful hatching experience and to minimize the risk of further abandonment. At some point I suspect I'll start taking this abandonment personally.. Regarding the previous couple, I have more questions than answers. Did they find themselves, as first time parents, overwhelmed by the prospect of raising four little ones? Were they called away on an emergency leaving Mr. and Mrs. Dove in charge never suspecting they were the sort that would invoke squatters rights taking their home and abandoning their children only to raise their own?